Chaitra Navratri, also known as Vasant Navratri, begins on April 6, 2019. This festival of nine nights in Hinduism is dedicated to Goddess Durga, Lakshmi and Saraswati. It is also known as Chaitra Navratri or Spring Navratri or Vasant Navratri. As this Navratri coincides with Ram Navami, it also referred as Ram Navratri. The dates are from April 6, 2019 to April 14, 2019. Chaitra Navratri is observed in the Hindu month of Chaitra (March – April). It is believed that Goddess Durga was originally worshipped (Durga Puja) in the Chaitra month and was also referred as Basanti Puja. It was Lord Ram who changed the period of Durga Puja. Lord Ram wanted to get the blessings of Goddess Durga before beginning the war with Ravana in the Ramayana. 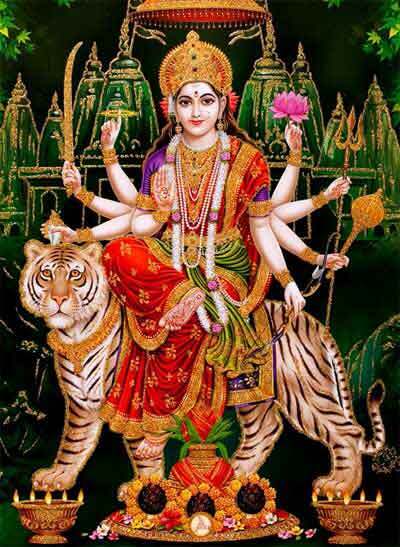 Therefore he invoked Goddess Durga during Ashwin (October – November). This is why the Durga Puja during October is also known as Akal Bodhon or untimely invocation. Chaitra Navratri is the original period of Navratri festival. It was changed by Lord. The story of Chaitra Navratri is the same as Sharad Navratri of Goddess Durga annihilating Mahishasura. The above said mantra should be chanted 108 times daily in the morning for nine days for desire fulfillment. Chaitra Navratri puja begins with Ghatasthapana or Kalash Sthapana Puja. The puja involves invoking the mother Goddess in a Pot or Kalash and sowing of seeds (barely etc). The pot is sprinkled with water on all the nine days. Pujas and other rituals are performed. At the end of the ninth day, the barley shoots will reach a height of 2 to 3 inches and its then pulled out and distributed. The eighth day of the the nine-day festival is of great significance. Special pujas and rituals are observed on the day. Goddess Shakti temples in North India see huge rush on the day. Tarashtami, Mahashtami, Mahanisha Puja and Annapurna Parikrama are observed on the day. In eastern parts of India, Chaitra Ashtami is observed as Ashokastami. Annapurna Puja is also observed on the day. The Vasant or Spring Navratri is widely observed in Himachal Pradesh, Uttarakhand (Uttaranchal), Haryana, Punjab, Uttar Pradesh, Rajasthan, Madhya Pradesh and Jammu and Kashmir. Most Hindu devotees in this part of India undertake Navratri Vrat or fasting. The festival occurs during the beginning of summer season. And it is said that the fasting helps in adapting the body to the changing climate. Almost all the rituals observed during Navratri (held in October-November) are also observed during Vasant Navratri. One of the important events in Haryana and Punjab is the worshipping of little girls. These little girls symbolically represent Goddess Durga and are known as ‘kanjaks.’ It is performed on the eight day or the Ashtami day. The rituals i also known as Kumari Puja. Read more about Chaitra Navratri Kanjak Ashtami Puja. Goddess Mansa Devi is an important incarnation of Goddess Shakti and in this form she is very popular in the Himalayas. Millions of devotees arrive at the Mansa Devi Temple worship Mansa Devi during Chaitra Navratri. The most important dates are Chaitra Saptami, Ashtami and Navami. Note - The most important Navratri which coincides with the Durga Puja in 2019 begins on September 29 and ends on October 7. Chaitra Navratri Puja Vidhi - How to observe Chaitra Navratri?